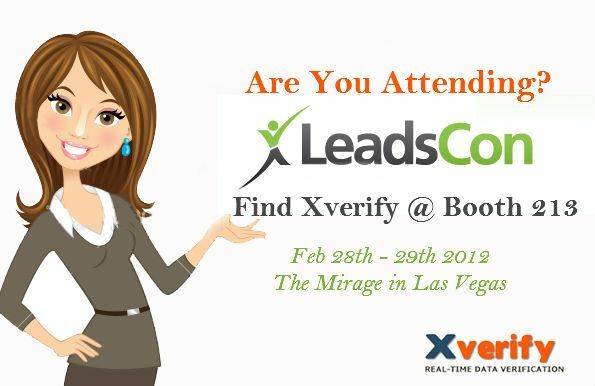 Xverify is pleased to announce we will be exhibiting at LeadsCon and you can find us at booth #213 February 28 – 29th 2012 at the Mirage in Las Vegas. We have recently revamped our website; added new services such as phone confirm and reverse phone, as well as added new settings to our existing services. As I mentioned we added new features to our existing services such as giving you the ability to not accept toll free phone numbers. This will help you eliminate many business based phone numbers if you choose to enable this custom rule. We will even allow you to add or remove specific area codes so there maybe reasons you want to accept 800 numbers but not 877 numbers. We are now also providing you with opportunities to use test email IDs that do not cost you verification. We had several clients request a way that they could test their registration paths without increasing the number of verifications used. You can now setup one or more testing email IDs and any time those email ids go through validation they will not appear as verification. Keyword blocking is another new rule we have released for email verification. Suppose you are acquiring many email Ids such as webmaster, admin, test, fake you can specify keywords such as these and any time the handle of the email contains the keywords we will suppress those for you and prompt the user to enter a different email ID.